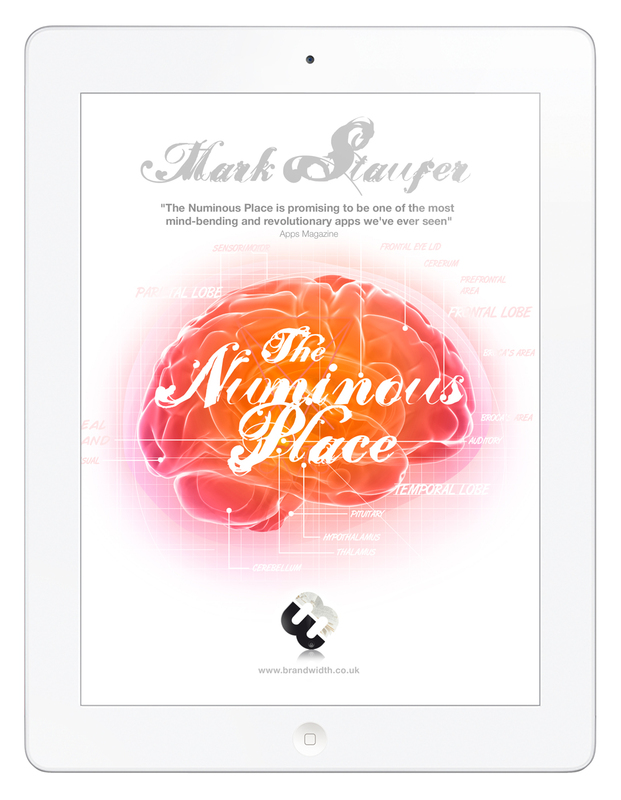 Hollywood screenwriter, Mark Staufer, recently unveiled the prototype for The Numinous Place. I caught up with Mark, and Dean Johnson, VP of Innovation at Brandwidth, the firm who designed and developed the app, to see how things are proceeding for this emerging franchise that is generating a lot of buzz. Mark, you unveiled the TNP prototype and introduced it to the world at the Frankfurt Book Fair. How was it received? The Frankfurt Book Fair was like the second moment of truth for The Numinous Place after Kickstarter. With nearly every major publisher and more than 300,000 (yes—Three. Hundred. Thousand) industry professionals in attendance, this was the best possible launch-pad for us. We were confident we had the goods, but with so many people, I was concerned we might get buried. I was also worried I was skiing way off-piste—I know Hollywood and how it works, the world of books is a different animal: impenetrable, haughty, somewhat hidebound. And The Numinous Place is so different from what they’re used to. I was anxious I was turning up at a cat show with a platypus. But, you know, I’ve always believed this is my destiny project, and that our time had come, and in the end everything conspired brilliantly. I’m overwhelmed by the response. Dean, how was it from your perspective? The positive response in the US, at the Frankfurt Book fair and back in the UK has been quite overwhelming. It really does feel as if the audience is ready for someone to raise the bar. Six months ago, this wouldn’t have been the case. Without giving away trade secrets, how did Brandwidth adapt technology to meet Mark’s vision? What was the greatest challenge? It’s all about the seamless narrative as we are still primarily catering to readers, not viewers or gamers. They don’t want interactive content to break their reading experience and obstruct the well-written text. Our audio enhances, video is contained within the key text and interaction occurs as a result of the narrative, not in spite of it. The secret is to produce an app where the technology is recessive, not excessive. Mark understood all this so the text and the tech met in the middle. How much of a “stretch” has TNP been for Brandwidth? Brandwidth works with some of the largest global brands to select, design, develop, market and maintain great digital content. The end product takes many shapes on the most appropriate platforms – from Enterprise-level websites, apps, iBooks, 3D and gestural screen technology to the future of Smart TV. That sounds a little dry, but when our clients include publishers, music labels, TV and film studios, automotive manufacturers and museums with some incredible raw materials, we love bringing this stuff to life and engaging our audience. TNP wasn’t unfamiliar, but presented an interesting challenge. One of the misperceptions I see in this type of work is that collaboration within publishing just exists for licensing deals and a client/supplier relationship. The Numinous Place wouldn’t have existed without genuine teamwork across an incredibly diverse set of disciplines, from writer, musician and dream expert to designer, developer and marketer. Dean, what do you see as technology’s role in facilitating Storytelling? What should writers be aware of as they approach new work? Apps allow us to push the boundaries, and Apple’s platform in particular caters to the highest possible denominator, rather than the lowest. Transmedia projects are employing gaming and multiplatform (and multi-reader) participation with mixed results. There’s a great opportunity to appeal to a different audience with these elements but not necessarily a familiar readership. Too much interaction can be a distraction, but I envisage future developments taking the story beyond the book, with online and electronic billboards continuing the narrative between reading sessions. Well, perhaps not that far in the future. Authors should be aware that there’s a whole bunch of bells and whistles available. Throw everything at your readers and you’ll soon find you’ve lost your audience. I would advise them to write with technology in mind, rather than adding the digital experience as an afterthought. Excellent point. Mark, what did you want to accomplish during your time in Frankfurt? Did you meet those goals? We were confident that we had a really great story to tell, even so, we were telling that story in a way like never before and the publishing industry isn’t renowned for radical forward thinking and risk-taking. Also, attracting a publisher for the e- and print-book parts of the puzzle was just part of it. We also needed investment for the four app-book versions which would allow us to release and market them, and hopefully begin developing the game, and screen adaptation. We ticked all the boxes. That’s wonderful. Did the Universe open any different opportunities beyond what you had imagined while you were there? As always, the Universe had much more in store than my mere imaginings. I met some wonderful people, who I made a deep connection with, and the whole experience underlined my belief that you get back what you put out. The publishers and investors who came my way were the ones who got it, and if they didn’t at first, as soon as I showed them the magnificent prototype that Brandwidth designed, they got very excited. Showing works better than telling with The Numinous Place, definitely. I met a Brazilian writer and publisher, Francisco Pereira who offered support and guidance and will be my friend for life. And, after my presentation, author Jonathan Gottschall approached me. Gottschall is a bloody genius, by the way—check out his website, and if you’re a writer, or in business, or just interested in the immense power of story, you gotta get his book “The Storytelling Animal.” Seriously, buy it right now. We evolve as our projects do. Mark, what changed in/for you during your time in Frankfurt? I trust my intuition much more. It’s the most profoundly important sense/talent that we human beings possess, and it needs to be nurtured and tuned. The Numinous Place is a supernatural thriller, but it’s also a spiritual quest. The main character, Henry Meat, has insisted on certain narrative directions that I’ve sometimes fought against for writerly reasons. Even though my brain tells me that such-and-such should now be happening, Henry will fight me tooth and nail if it’s not the authentic story. Sometimes, I’m just not even sure where he’s taking me plot-wise, and I’ve put it down to luck when things work out in the narrative and it comes together. Now I realize that with Henry, and with life, you’ve gotta have faith and rely on your intuition. I’m also cognizant of the fact that I sound a little crazy with all this “Use the force, Luke” Sufi-stuff. Don’t take my word for it—dive in yourself: see if intuition and trust and honesty don’t improve your writing and your life. How important is it for creatives to have faith and stay true to their vision during the development/financing/production phases of projects? Words of advice? OK, so let’s talk about energy for a moment. The Dao, the Force, the Universe, nature, chi, the Field, prana, lung, the Gods—even if you’re a complete atheist like I used to be, and materialist science is the infrastructure within which you place your faith, at some stage you must let go. You must construct each of the phases of your creative endeavor to the best of your ability, and only when you are supremely confident that you’ve done your best, and the time is right, should you move onto the next one. And then, at some stage, when your intuition tells you everything is aligned—and you possess the energy necessary—shepherd it out into the Universe. The right people will find it, and they will help you. I should add that, initially, when I sent the Numinous Place out into the Universe, it clearly was not the right time.I didn’t listen to my intuition, and about a year ago, I sent the manuscript and concept to more than 100 agents. The few replies I received were pretty dismissive. Even though they didn’t even read the manuscript, they didn’t see the vision and couldn’t understand what I was trying to achieve. Things have moved along now technologically, and for us as well—we’re still operating without representation which is clearly not an essential piece of this particular puzzle. I’m sure there are some big-thinking agents out there, the Universe just doesn’t believe The Numinous Place needs one at this point, and maybe other creatives need to approach their work in such a way. The old ways are not always the best ways. That can be so true. We really do need to start looking at our work in terms of what will best serve the story and facilitate reaching the audience. We need to be courageous in being willing to be different. What’s next now for TNP? Thank you, Mark and Dean. We’re looking forward to following TNP. Posted on Monday, in Interview, Mark Staufer, Story. Bookmark the permalink. 5 Comments.